"Davine Ker is a most prolific and seemingly ubiquitous artist, musician, chef, comedian, storyteller and mother. And Absolutely Hilarious! Laughs and positive energy…empowering and connecting others with optimism." "Headliner Ker did not disappoint, evoking laughter from the crowd throughout her entire routine." 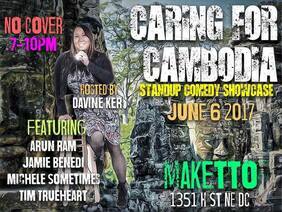 Davine Ker is a stand up comedian, improvisor, musical improviser, Moth StorySLAM winner, actor, visual artist and a musician. Davine caters to your comedy appetite while sharing her laugh story with decadent wit cream. She has performed at The Source Theatre, The DC Arts Center, The Howard Theatre, Arlington Drafthouse, BloomBars in DC, Jammin Java, Lincoln Theatre, Sully's Comedy Club, Baltimore Comedy Factory, DC Improv Comedy Club, Cozzy's Comedy Club, Magooby's Joke House, Liberty Laughs Comedy Club, Broadway Comedy Club and Dangerfields Comedy Club in NYC. Davine Ker has shared the stage with the likes of Guy Torry, Todd Bridges, Willie Tyler, Pat Dixon,Jeffrey Gurian, Greer Barnes and Canadian legend Mike MacDonald. She speaks English, French, Cambodian and Comedian very fluently. She was affiliated with Laugh Index Theatre as a house comic, is currently a contributing columnist with Bliss Magazine, and is a radio DJ/Host with Urcityradio.com.